If you don’t work in publishing, you might not realize how many Harry Potter wannabes have been pitched, published, and forgotten since the series started hitting bestseller lists. It is easy to lump Lady Georgia Byng’s Molly Moon series in with the rest of the field of imitators, but at least they have a cute dog. 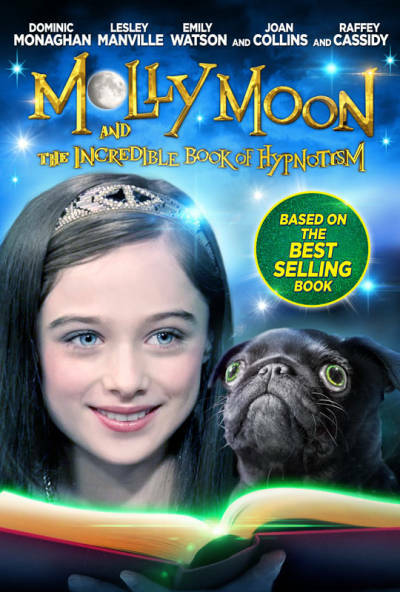 They also have a nice theme of empowerment for young girls judging from Christopher N. Rowley’s big screen adaptation of her first adventure, Molly Moon and the Incredible Book of Hypnotism (trailer here), which opens this Friday in select cities. Molly Moon is an orphan, whose pluck rubs Miss Adderstone, the mean-spirited headmistress decidedly the wrong way. Fellow orphan Rocky Scarlet is her best friend and probably future boyfriend, but they’re only eleven, so that will have to wait. Adderstone is so strict, Moon can only read quietly to herself when she sneaks off to the village library. It is there she happens across a rare hypnotism instructional book. This antiquarian volume really works, which is why bumbling smalltime crook Simon Nockman is so desperate to find it. Experimenting with her new powers, Moon first mesmerizes Miss Adderstone’s snarly pug Petula with great success. She soon follows-up by hypnotizing Edna, the dreadful orphanage cook and Miss Adderstone. Life is suddenly livable in the waifs’ home, but when she neglects the high maintenance Scarlet, he up and gets himself adopted. Moon follows him to London, where things get even more complicated, thanks to Nockman. Moon’s first outing is much more modest in scope than the Potters, but they skew towards a younger audience. Frankly, the closer you are demographically to Mademoiselle Moon, the more you are likely to enjoy her film. Still, grown-ups can at least appreciate her resiliency, as well as her aversion to self-pity and habit of accepting responsibility. Basically, she is a good kid who gets caught up in some unusual situations. Young Raffey Cassidy is quite well cast as Moon, displaying an appropriately winning screen presence and plenty of energy. In contrast, Dominic Monaghan (from Lost and Lord of the Rings) would probably prefer to forget the shtick and pratfalls that were required of him as the nebbish Nockman. Emily Watson has probably never been as mousey and milquetoast as she is as Miss Trinkleberry, the only kind-hearted orphanage staff-member, which is certainly saying something. However, Joan Collins’ scenery-chewing appearances as Nockman’s villainous mother are rather amusing in a nostalgic kind of way. There is nothing objectionable in screenwriter Chris Hurford’s adaptation of Byng’s children’s book and there is a good deal of merit to its spirited protagonist. With its respectable production values and Rowley’s healthy pacing, it makes a decent programming choice for kids (but it will not overwhelm their parents). Recommended accordingly, Molly Moon and the Incredible Book of Hypnotism opens this Friday (8/14) in theaters and also releases on iTunes.